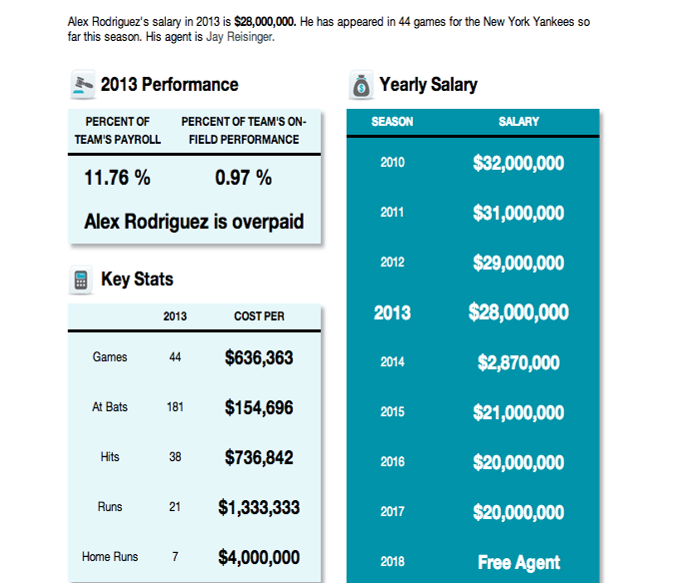 This is a breakdown of Alex Rodriguez's salary from 2013, which was $28 million. His checks take up 11.76 percent of the Yankees total payroll, and is .97 percent of the teams total on-field performance. If you were to break down how this $28 million was made it would look like this. Per game (44) he made $636,363. Per at bat, which he had 181, he made $154,696. For each of his 38 hits he made $736,842. When he had a run, which was 21 times, he made $1,333,333. And finally for every home run he made $4 million. He had 7 home runs, which means just for home runs alone he made $28 million. Even though his early salary went down in 2014 to just under $3 million, Rodriguez isn't hurting for money. The money from 2015-2017 is all guaranteed. And all of this cash is before his signing bonus, sponsorship deals, and other investments. But what about those taxes we talked about earlier? Some states require athletes pay taxes if they are having an extended stay in their state, called a jock tax or player tax. These fees can be figured by using the duty days method or the game days method. So for a three game series in Anaheim, Rodriguez is having to pay back about $53,200. That player tax number seems a lot like pocket change to me. But how many more of our athletes are being paid in this same way? Millions of dollars are being made with a minimal fee to play in another state, and not every state has these player taxes. The disconnect for me comes as a Christ follower. I hear about modern-day slavery where 27 million people are stuck in human trafficking. I hear about people who are so poor they can't afford to pay for food for their kids. I hear about kids who don't have shoes so they can't go to school to get an education, yet we have some athletes making $4 million because they got a home run in a baseball game. Keeping with the one home run theme let's break down what $4 million would do for some different organizations and people who really need help. Human trafficking is a multi-billion dollar "business" where the average slave costs $90. Organizations like The A21 Campaign, The International Justice Mission, and Not For Sale are constantly looking for donations to keep the vision of ending modern day slavery in our lifetime a real possibility. Hunger is the greatest risk to worldwide health, and it kills more people than AIDS, malaria, and tuberculosis combined. Many people think lack of food is the cause of hunger, but that is not the case. Enough food is produced each year to feed everyone. The main cause of hunger is poverty. Organizations like FEED are employing local artisans of the countries they are trying to help to make bags, which they sell on their website to you! With the money that is used to buy the bag, you are feeding children for anywhere from five school meals to 1,000 school meals, to providing micronutrients for people for up to two years. So the average bag with FEED is $75 and either provides 75 school meals or a years worth of micronutrients. With $4 million you can buy 53,333 bags from FEED. If we divide this down the middle you are giving almost 26,666 children meals for 75 days, or 26,666 people a years worth of micronutrients to stay healthy. In most countries, when kids don't wear shoes they can't go to school. Toms shoes is changing that. The whole concept of one for one, where you buy a pair of shoes and Toms will give a pair to a child in need is revolutionary. Toms donates all across the world, from Haiti, El Salvador, Uganda, Argentina, America, and other places. The average pair of classic solid colored Toms cost $48. With $4 million you can buy just over 83,300 pairs of Toms, ensuring that just over 83,300 children will be able to go to school to get an education. The amount of people that are helped with the money that is generated from one home run hit from one player is amazing. With all of this do you think our professional athletes are paid too much now?